Recently, some of our most exciting releases have made great use of the tarot-sized card. Tarot cards are taller than playing cards and allow a pleasant balance between legible game text and generous design space. However, you should be aware that not all “tarot” cards share the same dimensions. Manufacturers throughout the industry have introduced a number of differently-sized cards. 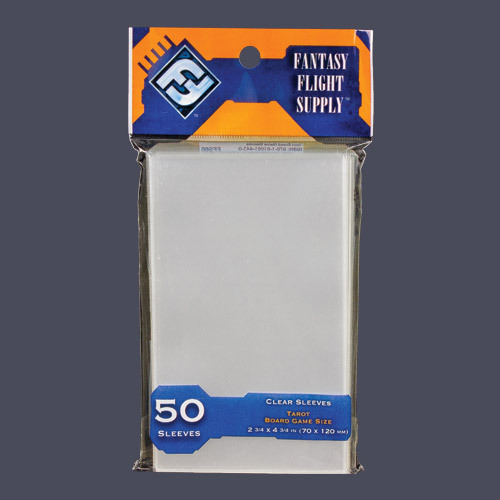 At 2 3/4” by 4 3/4” (70 x 120 mm), the new Fantasy Flight Supply Tarot Card Sleeves will be the perfect fit for cards from the hit games, Elder Sign and Infiltration! They also fit older games like Lord of the Rings: The Confrontation Deluxe Edition, and because these sleeves are slightly taller than the average tarot card, you can use them for just about any game that has a tarot-sized card.